The Minnesota Information Systems Audit & Control Association (ISACA) Board would like to invite you to advertise on our web site at www.mnisaca.org. 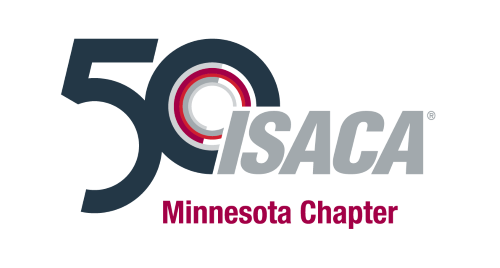 The Minnesota ISACA chapter has approximately 1,100 information technology audit, security, and governance professionals in the Twin Cities Metro area and greater Minnesota. The web site is a single point of contact for our chapter members to obtain information about chapter events and advertisements. As a result, it is an excellent advertising option for such listings as employment openings and training events. The Board will also distribute email newsletters quarterly to inform the chapter membership of website updates and upcoming events. Future open roles will be listed here. The Minnesota Information Systems Audit & Control Association (ISACA) Board would like to invite you to advertise on this website. The Minnesota ISACA chapter has more than 1,100 information technology audit, security and governance professionals in the Twin Cities Metro area and greater Minnesota. The website is a single point of contact for our chapter members to obtain information about chapter events and advertisements. As a result, it is an excellent advertising option for listing employment openings. For more job posting information, please email us at communications@mnisaca.org. If you choose to advertise on the National website, simply enter the code listed below and you will receive 10% off the normal national job posting fee!